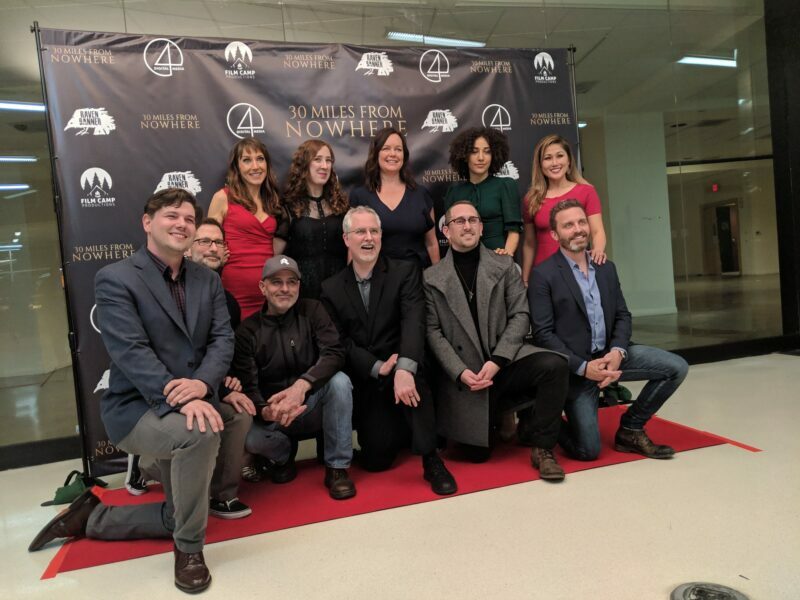 The cast and crew from 30 Miles From Nowhere. It was a muggy Los Angeles evening last Thursday, February 28, but the talent inside the Landmark Theater was warm and bright! 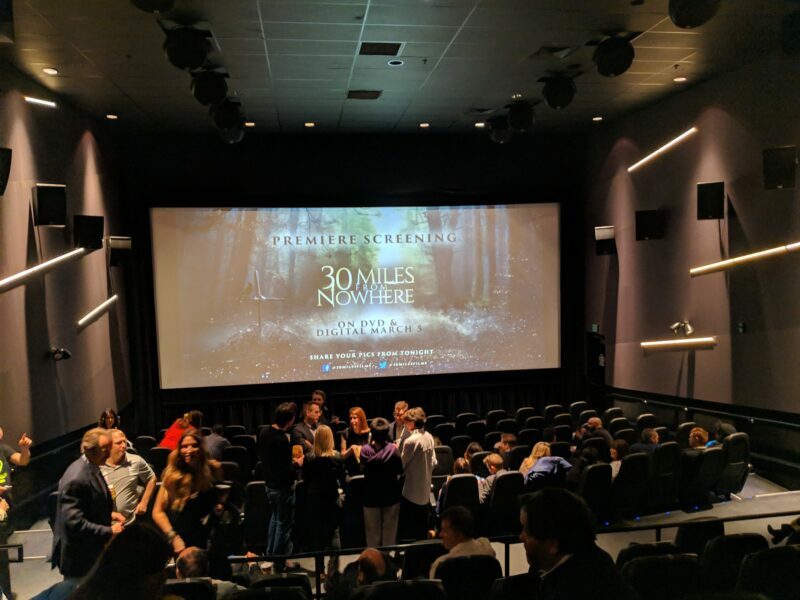 Nerds and Beyond was invited to the premiere screening of 30 Miles From Nowhere, and we had a blast! We stood back and watched as the cast and crew reunited to celebrate the success of this great horror film. It’s really singular in it’s field – we’ve talked before how this movie was the recipient of the Reframe stamp, and indeed as we looked around we were surrounded by talented women. The atmosphere was friendly, and we got a chance to ask the director, Caitlin Koller, a few questions about the film. Nerds and Beyond: Now that we’ve seen the film and you’ve screened it for a large audience, what were your favorite scenes to shoot? Caitlin Koller: I think my favorites scenes to shoot would be the ones with lots of blood. Because I love blood and gore and slasher movies and so it makes me really excited to work with the things that I love. There’s a scene with Seana [Kofoed], that’s also one of her favorites, and William Smillie and they’re up in the attic talking about how all of their friends are going to sleep together. It’s a very lovely, touching scene about platonic male-female friendship, which you don’t get to see often in films these days. It’s just a really lovely moment that brings a bit peace to a very crazy chaotic movie. Nerds and Beyond: One of the things we also wanted to ask was about the “Re-Frame” designation that you guys got, which is fantastic. Can you tell us a little bit about breaking into the horror industry as a female director? That’s huge. What advice would you give to other women that are trying to get into the genre? And what was challenging about it? Caitlin Koller: I think there are a lot of things that can be hard just by being young, especially, and being a woman in filmmaking in general. But I think right now there’s a big wave, a big push to help women filmmakers in the industry, especially in horror, and I think that’s really important. Film festivals, like the AxeWound Film Festival, and Stranger With My Face, these are festivals that are highlighting women in the genre circuit and female identifying filmmakers and it’s really important to recognize these accomplishments. It’s one of the ways that we can push forward with new and interesting content. Which I think we haven’t seen before, so I think it’s amazing that we can do it. We could have talked with Caitlin all night – she was so excited about the film! Fortunately, we also got to steal one of the films stars Rob Benedict away to ask him a few questions about his experience. 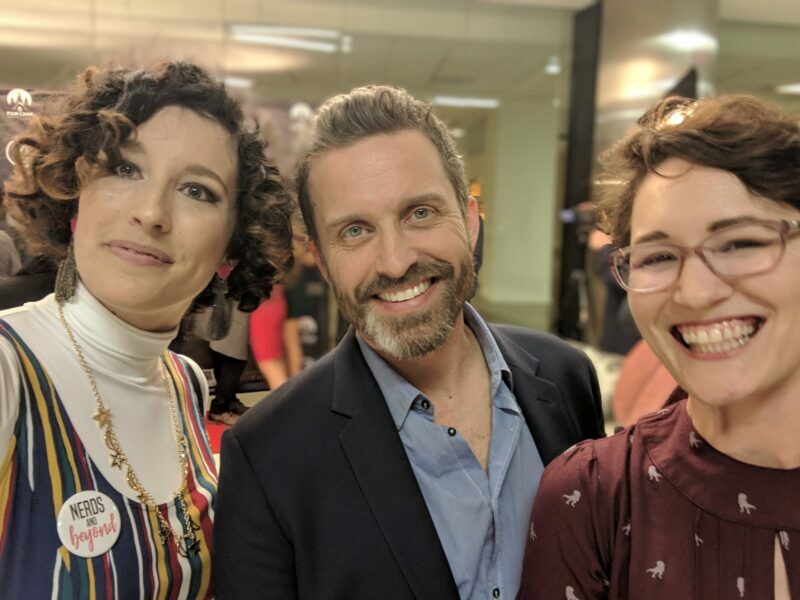 Staff writers Britt (left) and Becky (right) with Rob Benedict. Nerds and Beyond: What drew you to the project? Rob Benedict: I went to college with a couple of the producers, including Seana Kofoed, who wrote and stars in the movie. So Seana sent me the script and said, “we really want you to be in this” and you never know when you read a script that a friend wrote – but I read the script and it was great! Nerds and Beyond: We read that most of the actors in the film were handpicked could you tell us a bit about that process? Nerds and Beyond: What’s your favorite horror film? Rob Benedict: I like the heady ones. I like films like The Sixth Sense and most recently Get Out. I like horror films that aren’t quite slasher horror. I don’t want to go to bed at night wondering if a demon is going to get me. Rob Benedict: I’d rather go to bed just thinking about the movie. I want to sleep well at night, I get scared easily! We followed the cast and crew to the main screening room to watch the movie. Writer, producer and star Seana Kofoed introduced the film, and had this to say about it’s genesis. The film itself portrays everything that Seana was hoping for and more. The cast represents a diverse cross section of the population, and the characterization was never stereotypical – it was a breath of fresh air in a genre that can rely sometimes on generally sexist stereotypes. It was also at times a meta-commentary on the genre itself. At one point the characters joke that they are “like the Big Chill, but not as old” and in fact it really is like the Big Chill meets the Cabin in the Woods (Cabin itself being its own meta-send up of the genre.) It was refreshing however to see a the cabin trope as dealt with by fully grown adults instead of horny teenagers (ok they were also horny, but still.) We won’t spoil the plot for you because there were plenty of twists and turns (and gore, and laughs!) and besides, our own Briar already wrote a fabulous (and spoiler free) review you should check out. But we will mention that one of us screamed (alright, it was Becky, Britt is a horror movie pro) and it kept us both on the edges of our seats right till the very end. As we left the theater, Becky gave Rob a hearty thumbs up for a job well done. (His character is such a jerk, and it’s so counter to his normal roles but he pulled it off so well!) It can be a surreal experience to watch a film in the same room as the people that made it, but this time it was a particularly special experience because it was a room led by passionate women forging a new path forward in the horror genre. 30 Miles From Nowhere comes out on digital and DVD March 5. You can preorder it now on Amazon!